Multi-building fire on Stewart Avenue may be the end of the Chapter House. No injuries, thank goodness. Edited 1 time(s). Last edit at 04/14/2015 09:36AM by dag14. Extensive coverage in the Ithaca Voice, too. I'm still in denial about this, so in the meantime I'll ask: wasn't there a fire at the Chapter House about 20 years ago? Am I remembering correctly? The only other fire mentioned in the histories I've read was a kitchen grease fire in 1960 where the bar sustained smoke damage. In the late 90s, they did some minor remodeling as they pulled out the brewing tanks and the grilled cheese counter, which opened up the back "hallway" part for the pool tables, dart boards & music stage. They also replaced and expanded the tap system, IIRC. Edited 1 time(s). Last edit at 04/15/2015 06:15PM by RichH. With the Chapter House blaze, the Collegetown bar is a further endangered species. Protective legislation is needed. Wow, the Chapter House, Palms, Johnny O's, Dino'........did I hear that Pep sold his share of Dunbar's? And Lee long ago. Rulloff's has reopened I guess, is it any good? What is left? So many memories, so many hours, so many dollars spent! I've been meaning to put together a list. I'm sure somebody local will suggest corrections. Edited 2 time(s). Last edit at 05/12/2015 08:14PM by RichH. There's still some hope for the Chapter House. There's no mention of it in Journal, but the article was probably triggered by the item on Tuesday (7/14) night's agenda for the Ithaca Landmarks Preservation Commission. The Chapter House is in the East Hill Historic Preservation District, so it would have to be rebuilt in keeping with the original style. Updating this list with the news that both Pixel and Stella's have closed for good this summer. Edited 2 time(s). Last edit at 07/20/2015 12:28PM by RichH. Are The Greek House and The Souvlaki House too long gone to warrant an RIP? Did TSH have a bar? No bar, just beer and bad wine on the menu. And Peter and the S House are still going strong. I'm glad it has been granted eligibility, even if it has to take a red shirt year. I for one, am excited for my first visit to The Phoenix House. Edited 1 time(s). Last edit at 07/24/2015 12:42PM by RichH. Let's hope they get it right: tall ceilings, wood paneling, cozy front windows. Even if the walls have to come down, one hopes they can salvage the front facade woodwork on the first floor. no one makes thAt kind of stuff right anymore. If they are going to match a 1905 design, we could get a delightfully atmospheric rathskeller. The Ithaca Voice reports on expectations for Stella's reopening. The Ithaca Voice reports on preliminary plans for the Chapter House rebuild. 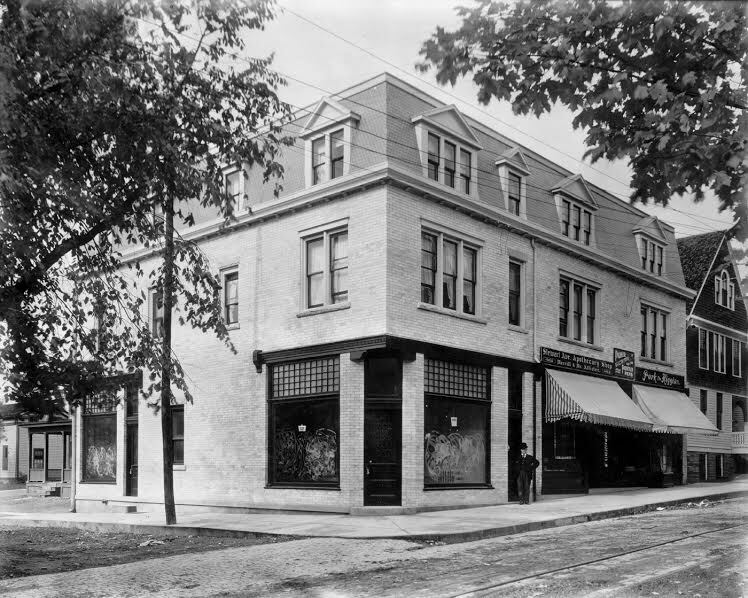 It's going to need approval from the Ithaca Landmarks Preservation Commission (ILPC), which can be quite prickly about maintaining the character of the original, before all the other approvals a new building requires. I'd wager that it takes several months just to get through ILPC. It's hard for me to imagine them hitting the target date of reopening in August 2016. Here's an old photo (c. 1905) to compare with the new design. Maybe the new design flies through. How is it that a building can remain a landmark after it burns down? Here the issue is one of maintaining the character of the neighborhood, the "East Hill Historic Preservation District". There's an "early design review" of the Chapter House rebuilding plans scheduled for Tuesday evening, 11/10/2015, before the Ithaca Landmarks Preservation Commission. Brian Crandall reports and comments. And in the Ithaca Voice. The Chapter House rebuild design is evolving. Brian Crandall comments.in his second bullet today. Generally, absentee landlords are nothing but festering carbuncles on the body politic. One wishes a cooperative of Cornellians and other interested locals could get together and remove such an important property from the clutches of these management companies upon management companies. It seems like there ought to be some sort of posthumous landmark status that forbids the owners from building anything except a new Chapter House on that site. Off again,on again. It sounds as though replacement of the building that housed the Chapter House is on again. There is some reading between the lines here, but the indications are that construction on something that looks looks like the old building will start soon. That new building may or may not house an establishment known as The Chapter House. I will cry with joy if the "possible layout" on the Pyramid brokerage flyer comes to pass. I want to be able to sit by the windows watching people struggle up and down Williams on a snowy evening again. There is not a doubt in my mind that a "reconstruction" would be the most lucrative use for that space. Let's hope things keep moving that way. Back in Ithaca for reunions over the weekend I noticed there seemed to be construction activity on the property. Mark Anbinder at 14850.com and Brian Crandell at The Ithaca Voice now report that is indeed the case, though a tenant for the planned first floor retail/restaurant space (formerly the Chapter House) has not been announced. Brian Crandall reports on construction progress at the Chapter House site and elicits from John Hoey, the proprietor of the Chapter House, the statement that he intends to bring back the Chapter House either at that location or in one of the other empty Collegetown bar sites. Brian Crandall reports good progress the building being erected where the Chapter House stood. From his photos, I would guess that most alumni won't realize that it's a new building. But I still haven't seen anything definitive about what will occupy the restaurant/bar space on the ground floor. The owners are looking for a tenant for 3000 sqft at $35/sqft gross. every time this gets updated for a second i think "ANOTHER FIRE?" The owners are looking for a tenantfor 3000 sqft at $35/sqft gross. Out of curiosity and some concern considering the comment at the bottom of Crandall's summary, can anyone speculate as to what the Chapter House's lease might have been before the fire? Or, for that matter, what a fair rate would be for the property, since no one seems to be biting at Pyramid's ask? As I have absolutely no experience in commercial properties, I'm wondering what spread is being "negotiated" here. Edited 1 time(s). Last edit at 02/19/2018 09:34AM by Scersk '97. No idea, but doing some quick calculations they'd need to sell about 150 beers a night, every night, at a markup of $2 each just to cover gross rent. I don't know what a good draft goes for in Ithaca these days, but if it's $5 that's bound to be a really thin margin over expenses, if it even covers at all. I suspect they'd need double or triple the 150/night volume at those prices, and that strikes me as a lot for a collegetown beer hall. Maybe they've poured a thousand beers on a busy Friday in February when the weather wasn't bad and nothing else was going on, but there are a lot of dead nights in the summer to weigh those averages down. Of course, more $ per beer means less volume required, but it also means less volume. In a college town bar catering primarily to broke graduate students my guess is the volume drop-off by price is pretty steep. Thanks for responding to my laziness with reason and a bit of math. Your back-of-the-envelope calculation seems about right to me, and I concur that the volume necessary seems unrealistic. And we're not even talking yet about taking care of employees, insurance, utilities, popcorn supplies, bathroom re-grouting, etc. My mind immediately headed on to the other kind of business that I think Pyramid is chasing, which would be a restaurant, I would guess. The markups would be significantly higher, but the labor costs and overhead would be too. I have no idea what the average mid-price restaurant clears per cover, but let's say it's $5. So, you'd need to do 50 covers per night every night, in that location? Also seems unrealistic. And anyway, does Ithaca need another restaurant, particularly there? Let's hope that Pyramid is open to significant negotiation. I expect it is, but given the fixed costs of the business gross receipts matter a lot. If you put a bar in there at those lease terms and turn 100% profit over beer, equipment, and maintenance cost on every $5 draft (which implies you get all that stuff for free) AND you have minimal staffing expense, you still go broke within the first year if you aren't selling 50-100 a night. Honestly, if you open in April you'll probably be out of business in August. Brian Crandall (The Village Voice) and Mark Anbinder (14850.com) report progress on construction of the buildings that are replacing burned Chapter House and adjacent apartments. The apartments appear to be on track for August occupancy. There is still no tenant for the bar/restaurant space. If ever there's a need for a GoFundMe campaign. Convince a couple of early-retirement Hotelies to take this on as community service. Pretty soon, Ithaca bars will come under the Endangered Species Act. In case you weren't sure, btw, that's $35/sqft gross PER YEAR, not per month. It works out to less than $9,000/month. Yeah, but even if you could allocate $1 of every beer sale to cover rent, that's 9000 beers/month, or 300/day. At 3 beers each, that's 100 unique customers each and every day of the year - Tuesdays in early June as well as the Saturday of the Harvard game. Sounds like a dicey proposition to me - and, apparently, to every potential tenant who has studied the actual numbers. ...still looking for a tenant. Excellent reporting but need to add three facts . First, the location, cause and origin of fire has never been proven and all indications are it started in alley between the chapterhouse and 4006. Second is that Goldman has just purchased 4006 Stewart avenue for cash a couple of months before fire and Third , the Chapterhouse has not been able to negotiate a lease compatible with its prior lease at same location in order to make it competitive and successful in college town where bars are a dying breed due to social networking and high operating expenses. We are looking at other locations to rebrand as Chapterhouse in college town close to our original location at 400-04 Stewart Ave.
John J.Hoey, President and CEO, Ithaca Brewing Company Inc dba The Chapterhouse . In my day, you didn't "rebrand" a bar. But that was before the Johnson School got really famous. Wait, did he just accuse someone of arson? If he did then he left out the terms of the insurance settlement. For the arson to be profitable the insurance would have to pay more than the cash purchase price - else Goldman is breaking even at best. Of course if the building had some type of fatal structural flaw then breaking even would be a good outcome assuming he trusts his structural engineer to keep quiet. Have we any real estate attorneys on the forum (or real estate coercion conversion specialists)? Edited 1 time(s). Last edit at 07/16/2018 02:13PM by marty.